In order to meet the huge market demands, we are involved in manufacturing and supplying a wide assortment of Abrasive Bonding Frit. This Abrasive Bonding Frit is extensively used for many years as enamels for coating, for example, metals and jewelry and for bonding abrasives. Our products are highly durable in nature. We are among the most sought after companies for providing Bonded Abrasives to our respected customers. These are manufactured by knowledgeable professionals using quality-proven metals, by professionals of vendor organization. These are checked by quality controllers on several important parameters. 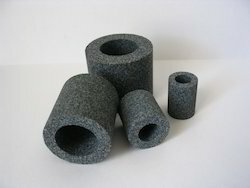 Bonded abrasives are mainly available as grinding wheels. These bonded abrasives are use in metal removal to finishing. User industries comprise automobiles, construction, fabrication, steel and bearings etc.